I'm sitting at Abi's bed right now. Ok are you all ready for this?! They took her off both medicine making her pee (Diuril and Lasix)!!! They took her off the sedatives (Versed)!!! They TOOK OUT 2 CHEST TUBES!!!! The bleeding in the heart area is that minimal. And ..... They are planning on waking her up slowly to ...... Try to take her off the ventilator TODAY if she's doing as she's doing. I was told she's a little star here doing better than expected and than normaly kids do! Everything else is in the norm. 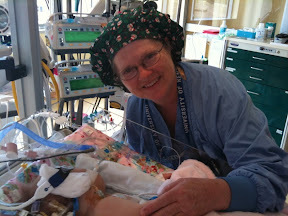 Below is Jackie, the awesome nurse who prayed for her during the surgery and who keeps on checking on Abi. Wow that is awesome. PTL!!! Tears in my eyes right now at How GREAT GOD is and how he cares for us so much! ABI ROCKS!!! she is my idol!! KEEP UP THE GOOD WORK ABI!!! Yay for Abi! She is a superstar!!! I know they say the babies are always so much more comfortable without the chest tubes, so it's good that they're gone for when she wakes up. I hope taking her off the vent is a very smooth transition. Wahoo! That is so totally awesome and makes me cry every time I read it!!!! THANK YOU JESUS!..... Man o Man o Man o Man! I am so thankful and greatful for this good news! I know you are too! We will continue to pray as she continues to be restored to your little precious daughter in your arms and at home! So amazing! Love you guys and rejoicing greatly w/you! Does Abi mean 'fighter of the Lord' in Polish?!! Holy Moly! She sounds like she's ready for the gifted program if she keeps this pace up! We know a little girl who made it home in exactly 14 days after the DS and I thought that was a record. You guys just might beat that! Way to go Abi. Still praying she comes off the vent just great and she can wake up and you can see that smile again soon. Prayers for Abi have been sent from far and wide...bringing amazing results! Mom and Dad, your strength and love have been helping Abi to fight to get back into your arms! WHAT great news and what a relief it's all going so amazingly well ....! Thank you for keeping us posted, i.e. for letting us know our prayers are being listened to and answered, constantly. Stay blessed dearest A, A & A. USCISKI, CALUSKI! Carol Kenyanjui. Abi, kochana wnusiu jestes dzielna. Trzymaj tak dalej. Mam nadzieje, ze wkrotce na Twoje buzi zobaczymy znow promienny usmiech. Nich Bog zawsze ma Cie w swojej opiece. oh how this makes my day!!!! so excited! still praying that things will continue on in this fashion. We truly serve a wonderful loving heavenly Daddy! triple A's we love you!